With classic bloodlines and exceptional speed, its no surprise Magic Sprite was a race track sensation, and astute breeders are not surprised that Magic Sprite is now proving to be a sensation at Stud. When a recurring stopper bone injury put a halt to his racing career, Magic Sprite’s racetrack performances left greyhound fans in no doubt that he was top class. Exceptional early pace coupled with undeniable strength, saw has him post 10 wins from just 11 starts, 7 of those victories coming in the best time of the night. But if his racetrack performances were breathless, his breeding is literally spectacular. By legendary sire Brett Lee out of the regally bred dam Glamorous, Magic Sprite contains the best bloodlines from Australia and Ireland. Glamorous is by the Irish stud sensation Spiral Nikita, who sired the 2010 Golden Easter Egg winner Cosmic Rumble, and her dam line is without peer in Australian breeding. Her mother is Leprechaun Yap who has produced the likes of Betty’s Angel, Miss Mini Mouse and a number of other top class Group 1 performers. He has imposing bloodlines, with a proven Irish outcross in a dam line that is considered one of the best in greyhound racing history, and his sire is one of the greatest greyhounds to race and a legendary Australian sire who produced champions. 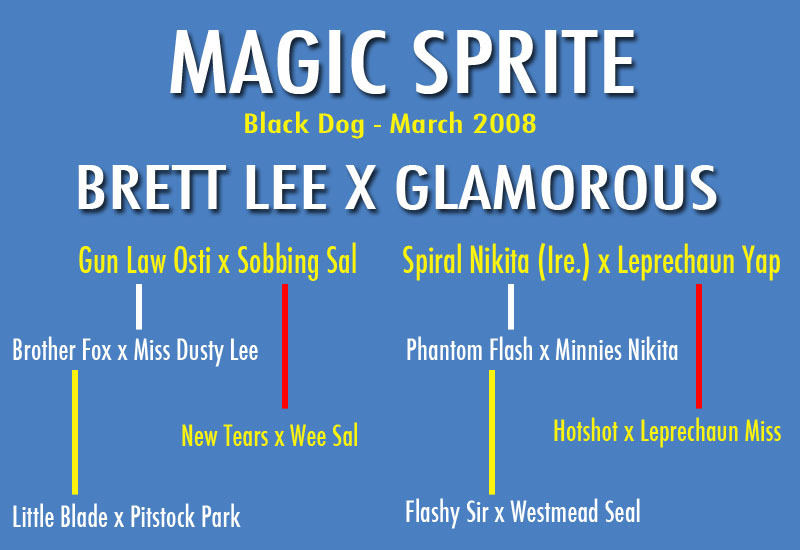 The first wave of Magic Sprite's pups hit race tracks in mid-2012 and since that time he has thrown thousands of winners including dual G1 winner Above All; G1 Melbourne Cup winner Black Magic Opal and literally hundreds of Group race winners throughout Australia and New Zealand as well as claiming Sires Premierships around the nation. Immaculate breeding, brilliant early pace, strength and determination. That's what Magic Sprite throws into his pups...what more could a breeder ask for?